Neena Nizar's story is a love story. It began with meeting Adam. Adam lived in the United States, and Neena lived in Dubai. There was a spatial difference between them, but more than that, there was a physical difference. Neena had a rare disease, one that caused difficulties walking and required frequent doctor visits. 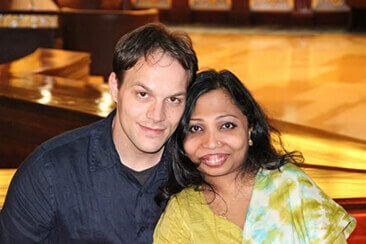 When Adam saw Neena for the first time, he asked her to marry him and to "give love a chance." Neena didn't want her disability to inconvenience the man she loved. But she clung to his words and took the leap with him. Then their love grew by two. 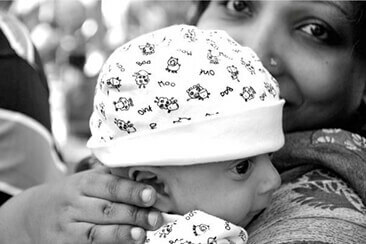 Arshaan, a beautiful and healthy baby boy, came into the world, the spitting image of his mother. As Neena was carrying their second son, she noticed that Arshaan's ankles and wrists seemed to be widening abnormally and his chest narrowing. A doctor would later tell her she was imagining it. Then, just four months into her second pregnancy, she learned that her unborn son's limbs were about six weeks off developmentally. It was suggested that she end her pregnancy. It was love that built this small family. It was love that kept her second son alive. And it was love that would keep them strong into their future. The disease that was causing developmental delays in her baby was the same disease that was causing changes in his older brother-similar irregularities Neena herself possessed. A doctor recognized it from a slide her professor had shown in class. In fact, the professor skipped it quickly, saying, 'this is so rare, you will never come across a case in your lifetime.' And yet, here they all were, exact matches to the rare disease. Finally, they had a diagnosis: Jansen's Metaphyseal Chondrodysplasia. It was genetic, and Neena had unknowingly passed it on to her two sons. "Personally, it was an absolute shock. I had never wanted to marry for fear of the anxiety of not being able to have a child," Neena said. "When doctors had said I never would carry a child to term, my world shattered. Just as we were considering adopting, Arshaan came along, bright-eyed and full of health. He was the biggest baby born in the ward on July 3, 2008. To watch all that unravel two years later was like watching ominous gray skies chase away the sun." Neena lived for 32 years with a misdiagnosis, something she called a "mysterious unnamed villain inside my body." Rare diseases are, by definition, infrequent, so the chances of finding someone with the same diagnosis is slim. Of the 7,000 rare diseases in the world, only 30 known cases of Jansen's exists. Neena and her sons are three of them. Still, Neena says, "This rare journey doesn't have to be a lonely one." Many people may struggle to know how suffering, loss, or pain could be part of a larger plan. "When I was 16, I received a full scholarship to study at Creighton University in Nebraska. At the time, my body was weak from surgery and my parents refused to send their only daughter so far away. I carried the scholarship letter forever," she said. "At the time, my mother had said, 'If you are destined to study in America, your path will lead you there.' Ten years later, I met Adam, a simple Nebraskan man, who asked me to marry him. Surprisingly, both of us wanted to make Dubai our home, but when we got a diagnosis for our boys, we knew we had to travel back to Nebraska, and in the fall of 2018, I will graduate from Creighton University with a doctoral degree in educational leadership." Neena remains adamant that, though it is a difficult path, it is a path worth traveling. 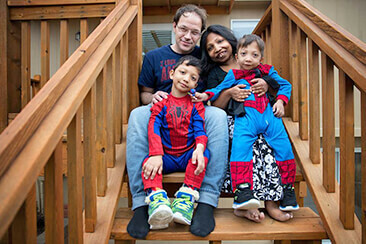 Without her sons, Neena may never have received a diagnosis. And without their participation in an upcoming research study, a cure for Jansen's may not even exist on the horizon. "For months leading up to the birth, Adam and I had decided on calling you Armaan. But as they handed you to me on that fateful afternoon five years ago, I had no memory of our plan. I couldn't think through all the tears. The tears that came from knowing that I finally had a diagnosis after 32 years. The tears that came from knowing that you too, like your older brother, would have a very different life from the one we had planned for you. I can't remember much of what happened in the hospital room that afternoon. But I do remember insisting that your name be Jahan. The sudden and insistent name change caused a little flutter. Post-partum depression, perhaps? But nobody was ready to argue with a grieving mom, and as the family hastened quietly to make that correction on your birth certificate, I too made a pact to silence my troubled heart. 'Jahan,' we later learned, was a Persian name meaning, 'protector' or 'savior of the world.' When I think back now, I smile and remain comforted by the knowledge that God had been by our side all along and had a better plan for you than we did. For you didn't come with just a diagnosis or a statistic, a mere condition to be boggled over. Instead, you came with a steely resolve and a silly smile to warm my aching heart. You came to complete our family and to be a wonderful friend to your brother. For God knew we needed you. He knew we needed you to come along to make things right. 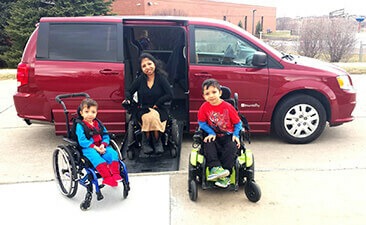 With Neena and her two sons in wheelchairs, the family needed help getting out of their house and back into the world. BraunAbility made a van perfect for them: with enough space for three wheelchairs and one that Neena could drive when Adam wasn't available. It was perfect; perhaps BraunAbility, too, was part of this love story. "The van or 'Speed Demon' is our trusted companion. I don't want to think about how we got around before SD. We could not take our wheelchairs anywhere, as we have three of them," Neena explained. "The van allowed me to get to work again! It allowed us to move around as a family and even take our wheelchairs on medical trips. I have not used a home health aide since getting SD, as the boys are now more independent and don't need to be transferred in and out of a car...they can just drive right into SD." As she drives, her mind is wrapped around finding a cure. It feels like a race against time because it is. With every day the boys grow, they are risking more corrective surgeries and more days of illness. Neena created The Jansen's Foundation to raise more money to fund the research that could save their family. Driving, though, is a brief reprieve from the constant reminder of the rare illness that drives their lives. "I love driving," said Neena. "I enjoy the feeling of independence it brings to someone who has a disability; it is assumed that your mission is simply to be a passenger. But here you are taking charge of your life. That's a big thing." Neena admits she has her moments of doubt. "When I see some of the pain my boys go through, I wish I had never met Adam and taken the plunge to marry and become a mother. But at those very moments of hopeless despair and disillusionment, I am always reminded that there is a bigger plan and purpose to everything that is happening in our lives." Today, Arshaan and Jahan are obsessed with superheroes: those with superhuman abilities and the strength to vanquish any enemy they happen upon. 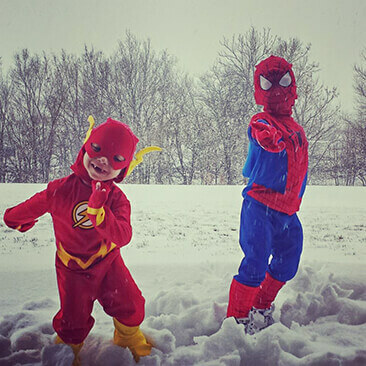 They tumble around their home in superhero costumes, their joy evident, their disease secondary. Arshaan and Jahan have the opportunity to become real-life superheroes with their participation in research for a cure for Jansen's. "So do I want to change anything? No. I'm still giving love a chance. I love my boys and am thankful for this incredible journey." Keep up with the family and the foundation by following theirFacebook page.